There are two big features in this release: support for nested data frames, and improved tools for turning implicit missing values into explicit missing values. These are described in detail below. As well as these big features, all tidyr verbs now handle grouped_df objects created by dplyr, gather() makes a character key column (instead of a factor), and there are lots of other minor fixes and improvements. Please see the release notes for a complete list of changes. nest() and unnest() have been overhauled to support a new way of structuring your data: the nested data frame. In a grouped data frame, you have one row per observation, and additional metadata define the groups. In a nested data frame, you have one row per group, and the individual observations are stored in a column that is a list of data frames. This is a useful structure when you have lists of other objects (like models) with one element per group. 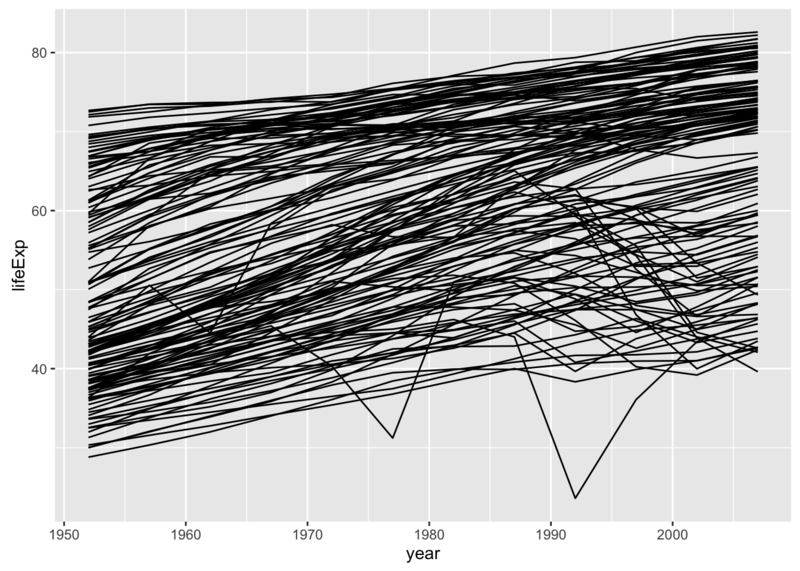 Because we used mutate(), we get an extra column containing one linear model per country. It might seem unnatural to store a list of linear models in a data frame. However, I think it is actually a really convenient and powerful strategy because it allows you to keep related vectors together. If you filter or arrange the vector of models, there’s no way for the other components to get out of sync. #>   AIC (dbl), BIC (dbl), deviance (dbl), df.residual (int). #> Variables not shown: statistic (dbl), p.value (dbl). #>   (dbl), .cooksd (dbl), .std.resid (dbl). I think storing multiple models in a data frame is a powerful and convenient technique, and I plan to write more about it in the future.